Members of the emergency services in protective suits work at the site of the grave of Luidmila Skripal, wife of former Russian inteligence officer Sergei Skripal, at London Road Cemetery in Salisbury, Britain, March 10, 2018. British government ministers met Saturday to discuss the case of a Russian man and his daughter who were mysteriously poisoned by a rare nerve agent in the town of Salisbury nearly a week ago. Home Secretary Amber Rudd said Saturday after the meeting that it is still “too early” to assign blame for the poisoning of former Russian spy Sergei Skripal and his daughter, Yulia, both of whom are hospitalized in critical condition. Meanwhile, about 180 British soldiers have been deployed to Salisbury, a normally quiet town in southwestern England, to help officials decontaminate the area. 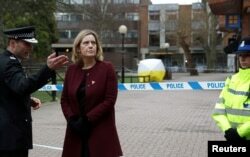 Britain's Home Secretary Amber Rudd visits the scene where Sergei Skripal and his daughter Yulia were found after having been poisoned by a nerve agent in Salisbury, Britain, March 9, 2018. Rudd said more than 240 pieces of evidence have been collected and 200 witnesses have been identified in the case. Officials have also cordoned off an Italian restaurant and a pub that Skripal and his daughter visited before their collapse as well as a cemetery where Skripal’s wife, Lyudmila, is buried and where there is also a memorial headstone for his son, Alexander. Lyudmila died in 2012 from cancer, while Alexander was cremated last year after reportedly dying of liver problems at the age of 43. Detectives are retracing the Skripals’ movements as they try to discover how and where the toxin was administered. Officials say 21 people in Salisbury have received medical treatment as a result of the nerve agent, including a police officer who is in serious condition. Police have not publicly talked about the nerve agent that poisoned the Skripals or who might have been responsible. But suspicions are pointing to Russia. British Defense Secretary Gavin Williamson said Britain is being “pushed around” by the Kremlin. Prime Minister Theresa May has promised an appropriate response if it is discovered that Russia is responsible for poisoning the Skripals, but has urged caution. “Let’s give the police the time and space to actually conduct their investigation,” May told ITV news Thursday. Skripal served in Russia’s military intelligence agency, GRU, and was exchanged in a spy swap in 2010 on the runway at Vienna’s airport. After serving four years in prison in Russia for spying for Britain’s espionage service, MI6, Skripal was one of four Russian double agents exchanged for 10 Russians expelled from the United States, including Manhattan socialite Anna Chapman.